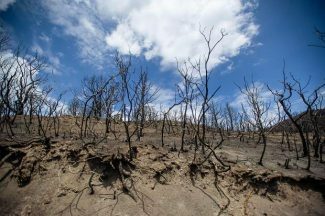 Devastation from the Lake Christine Fire off of Cedar Drive in Basalt on Wednesday. Shane Greer, the incident commander of Rocky Mountain Type 2 Incident Management Team Black, said the team’s goal is to have the fire out by the time they must rotate off duty after 14 days on the fire. As of Wednesday, they have been on duty for six days. The team’s 14th day will be Aug. 2. Greer said at a community meeting at Basalt High School last night he has also requested the return of two hotshot crews — ground forces with special skills — who were taken off the fire for a mandatory break after so many days. He said he is uncertain if they will be assigned back to the Lake Christine Fire or sent somewhere in the West deemed a higher priority. The Lake Christine Fire grew to 11,990 acres as of Wednesday night. It remains at 39 percent contained, but Greer said the containment figure should grow after assessments are made Wednesday night. You may have noticed there’s more of them, they’re larger and they make a lot more noise,” Greer said of the recent arrivals of helicopters.